My sister celebrated a birthday recently, and since we both believe that sending a card or present across the country for this event is necessary, I’ve been trying to think of other ways to celebrate. You know — it’s the thought that counts sort of thing. Two years ago, I posted a tribute to her. Last year, my husband and I held a candle and snapped a photo in mid, “Happy Birthday to You…” and this year? I thought I’d make her a cake. When I first thought of this, I really didn’t think she liked any type of cake, but I asked to make sure. After all, if someone who doesn’t really enjoy cake is going to have to appreciate a cake they’ll never get to taste, then it should at least seem appealing to them, don’t you think? Not only did I get a response from her, I got three: Angel food, German Chocolate, and cheesecake with coffee. The mention of angel food brought back memories of a cake she introduced me to, and that’s saying quite a bit because my sister doesn’t really enjoy cooking. So I thought about recreating that cake, but decided to save it for another time. Cheesecake is something I adore and make several times a year, so I passed on that one quickly. 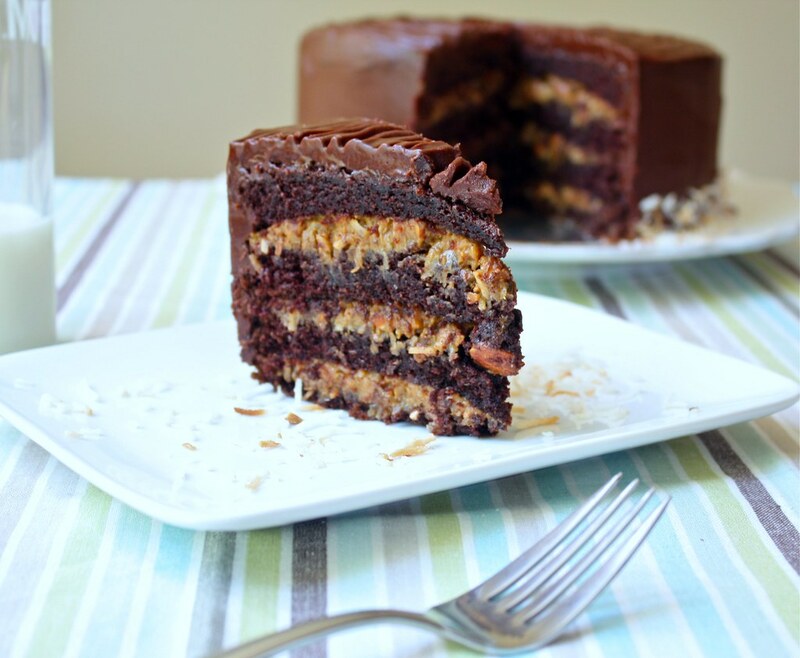 But German Chocolate cake? Really? Call me completely surprised! 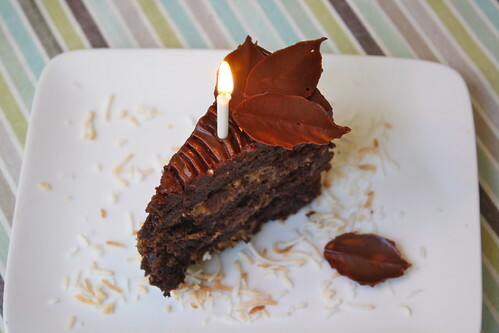 My thinking about German Chocolate cake is wrapped in memories of a gooey exterior hiding a dry cake that isn’t chocolate enough. It always seemed rude that the frosting promised something quite flavorful inside, yet it never lived up to my expectations. But I seem to be in the minority because no sooner had I begun to mention that I was going to make a German Chocolate cake, that I found out it’s not only enjoyed my many — it’s a favorite. Another surprise was finding out there’s nothing actually German about this cake. It’s named after Sam German who created Baker’s Sweet Chocolate. A Texas homemaker sent the now familiar recipe for German Chocolate Cake to a newspaper in 1957, and General Mills sent the recipe to newspapers all over the country. My search for the perfect recipe sent me to David Lebovitz’ site first, but after a quick scan of the ingredients listed, I realized I didn’t have buttermilk. Next stop was epicurious. I couldn’t get past the idea of what they described as an “inside out” cake. Evidently, a few people had decided it was a darn good cake since there were 236 reviews, most of which were raves. The problem I had with that recipe was the Dutch-processed cocoa. I can’t tell you how many stores I’ve searched in and have just decided to not deal with it anymore. Yes, there’s a conversion for using regular cocoa, but it’s not advised. 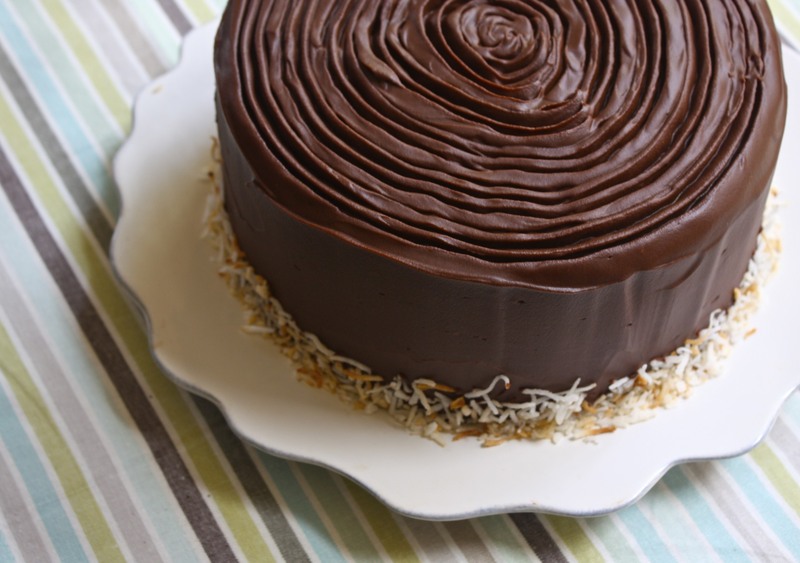 And when it comes right down to it, there are just about as many recipes for chocolate cake out there as there are renditions of German Chocolate cake. So guess what? I made it my own, of course. 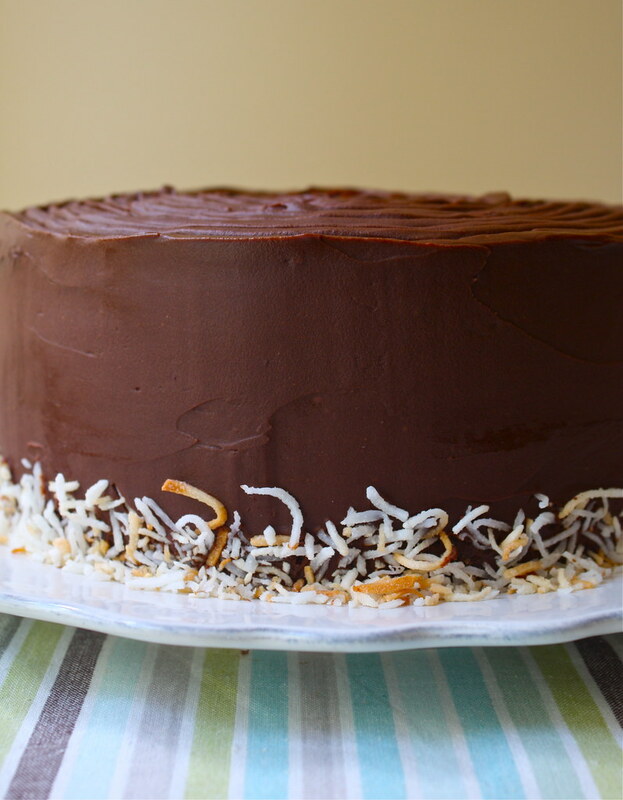 Sheer chocolate-coconut-dulce-de-leche-almond-crunchy-but-moist heaven. Spread the coconut on one baking sheet, and the chopped nuts on another. Bake for about 15 minutes or until coconut is just beginning to brown and nuts are aromatic. Remove from oven, and stir, then set aside. Turn the oven temperature up to 350 degrees F.
Prepare two 8″ x 3″ cake pans by lightly oiling, lining the bottoms with parchment, oiling again, then lightly dusting with flour. Set them on a large cookie sheet if you can. Heat some water to the boiling point — you’ll need to add it to the batter. In a large bowl, mix the flour, cocoa, baking soda and powder, and salt. Whisk a few times to blend well. Add the eggs, milk, oil, and vanilla to the dry ingredients, and beat at medium speed for 2-3 minutes. Pour the boiling water into the mixture and mix well. Pour batter into the prepared cake pans and place them in the oven to bake for 40-45 minutes or until a wooden skewer inserted into the center is clean after removed. Cool the layers in the pans on a rack for 15 minutes, then remove them and cool on the racks completely. When the layers are completely cool, cut each in half horizontally to create four layers. Remove all parchment. To prepare the filling, after removing the cake layers from the oven, turn the temperature up to 425 degrees F. Pour the sweetened condensed milk into a casserole dish that will fit inside a larger pan. Pour hot water into the larger pan to reach half way up the sides of the casserole. Cover the entire set up with foil and seal well. Bake for 45 minutes. At that point, remove the foil with extreme caution as steam will be released, and check the water level. Add more hot water to reach half way up the sides of the casserole again, seal well with foil and place back in the oven for an additional 45 minutes. The milk should be thick and the color of a rich caramel. Stir, and keep warm and covered. To prepare the topping, melt the butter in a sauce pan. Remove it from the heat and add the chocolate in small pieces, stirring until the chocolate is melted. Stir in the corn syrup. Reserve 1 cup in a bowl and place it in the fridge to thicken, about 1 hour. Stir well occasionally until it reaches a spreadable point. Keep the remainder of the chocolate mixture at room temperature. To assemble the cake, mix the dulce de leche, most of the coconut (save some for decoration if you wish), nuts and vanilla and stir well. The mixture must be spreadable. Pour in just enough heavy cream to achieve the desired consistency and mix well. Place the first cake layer on a piece of cardboard cut for the cake, or the removable metal bottom of a cake pan and place it over a baking rack set above a baking sheet to collect excess glaze when the topping goes on. Divide the filling into three equal quantities. Mound 1/3 of the filling onto the first layer and spread with an offset spatula that has been dipped in water. Continue until all layers are assembled. Cover the sides and top of the cake with the chilled chocolate. If it’s too firm, put it in the microwave for 5 seconds and stir until it softens, but do not over use the microwave or you’ll ruin the chocolate. Make sure the warm chocolate is pourable, reheating over an extremely low flame briefly, and then stirring until glossy and smooth. Pour over the center of the cake, and with an offset spatula, gently push it to the sides and over, smoothing as you go as little as possible. Warm water to dip the spatula in works wonders for this. 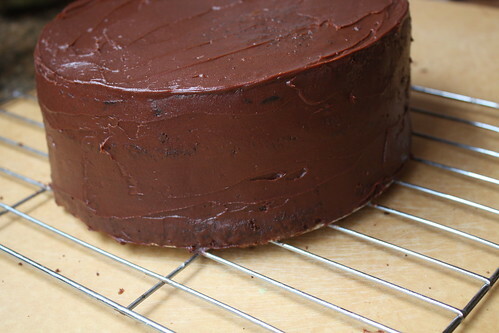 Allow to sit until the chocolate is finished dripping, and remove to a cake platter then refrigerate until serving. To slice, warm a knife in hot water. A printable version of this recipe is available here. I used the chocolate cake recipe on the back of the Hershey’s Cocoa box because I’ve also read that it’s the perfect chocolate cake. If it’s not perfect, then it’s pretty darn close. Unbelievably moist. More dense than light and fluffy so it worked quite well with the rich, heavy filling. If you don’t have the 8″ pans, then use 3-9″ pans and you won’t have to split the layers. The baking time will be shorter: 30-35 minutes. The filling was yet another experiment. Essentially, you’re making dulce-de-leche in the original recipe and I’ve done this several different ways, but primarily putting a closed can in a pan of water for an extended period of time. So I decided to try this waterbath method. It worked quite well, but with the timing of putting together all the parts of this cake (which I’ve adjusted in the directions above to make it easier to do…) my dulce-de-leche cooled too much and therefore, thickened. Plus, adding the coconut and nuts made it even thicker, so I decided to add the heavy cream bit by bit, stirring well between additions, and stopped when I liked the consistency. 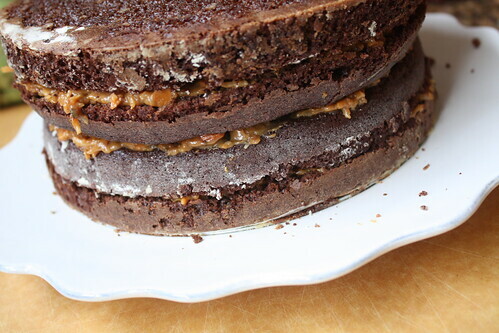 This softened the caramel taste a bit which was nice, and allowed the filling to spread over the layers more easily. On the coconut: 7 ounces is quite a bit of coconut. I did brown almost that much, but ended up not using all of it. Again, I judged by the consistency of the filling. Plus, having some left over allows for additional creativity. I used almonds because that’s what I had on hand. Besides, I love Almond Joy candy bars, and the almond-coconut-chocolate combo is always great to me. Make sure you chop the almonds well as larger chunks will make slicing the cake more difficult. Definitely take the time to do that first coating of chocolate. I filled my cake the night before and wrapped it well, keeping it at room temperature until the next morning when I frosted it. The chocolate in both cases was too firm to do anything with, but I was able to reheat it easily to spread and then pour over. On the chocolate leaves: While the chocolate is warm, use a small paint brush to coat the top of clean camellia leaves and then freeze until firmly set. 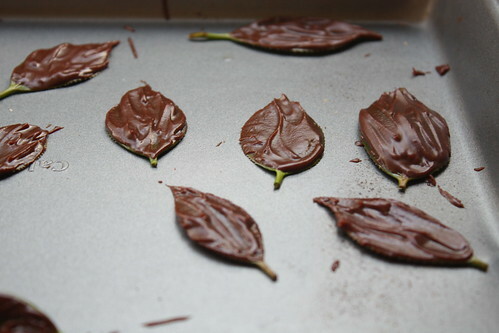 With very cold fingers, carefully peel away the leaf and immediately put the chocolate leaf back on the cold tray. If necessary, freeze until time to decorate the cake. Technically, this particular chocolate isn’t the best for making leaves because of the butter and corn syrup. It softens. Normally, melting semi-sweet chocolate by itself works just fine. I didn’t get any complaints about this cake at all. My husband shared at the office and said everyone liked it. I shared it at dinner with friends and plates were empty. What do I think? I loved the cake. Loved it. The filling was very good as well, but it is very, very rich. The chocolate glaze sends it over the edge for me, though. I enjoyed two pieces and in each case, some of the frosting was left on the plate. Truly a delicious, but very decadent dessert to slice in very small pieces.